Since I’ve been in Mwanza two things which I’ve enjoyed seeing are the little black faced monkeys who regularly visit our garden and the large colourful hibiscus flowers which grow everywhere. However, I have noticed that remnants of these stunning flowers were often strewn on the lawn. I didn’t know why, until now. While I was sat in the garden the other day trying to sketch both hibiscus and velvet monkeys, one of the monkeys ran boldly down the branch of the hibiscus tree, towards the flower, snatched the large trumpet shape, put it up to its mouth and shoved it in. Behind him was another monkey, who proceeded to start a fight with monkey number one. There was a full on brawl, with gnashing of tiny but sharp monkey teeth, lots of squealing noises and tufts of fur flying around; this was evenly matched. 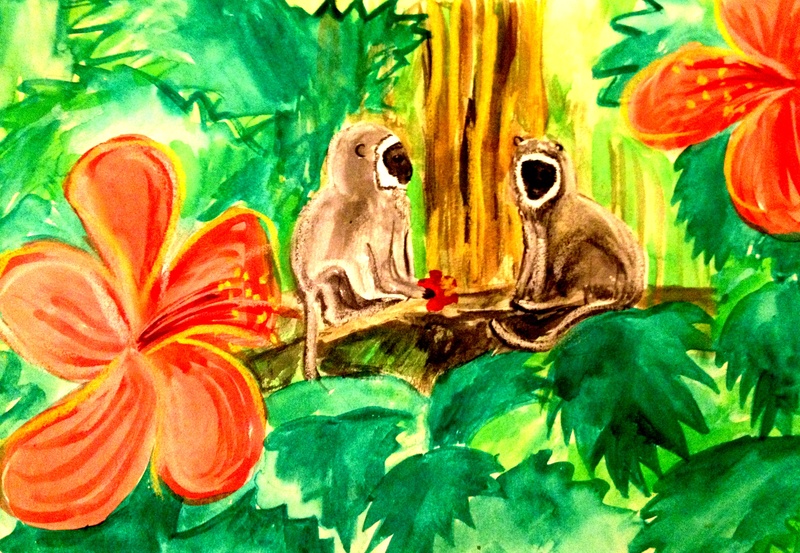 Eventually the monkeys calmed down and decided to share the flower. They then went on to divide the petals of all the hibiscus flowers on the tree, putting them into their mouths, as if they were chewing tobacco. And if monkeys could smirk, and I think they can, they both sat there smirking at me. So now I have solved the mystery of the chewed up and spat out tropical flowers, I have decided to put them in a painting together, entitled The Hibiscus Thieves. I hope you like it. Vervet monkey poised in a yellow oleander tree, ready to jump on the trampoline in my garden.